Back in the late 70s, if you were lucky enough to be home from school sick or on a holiday, you might have been lucky enough to see a master craftsman at work. 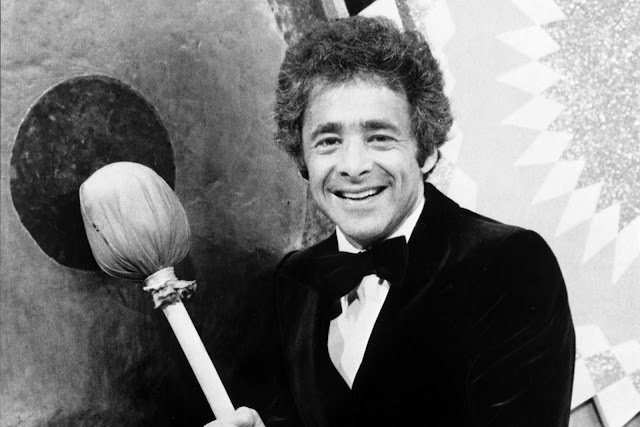 On June 14, 1976, Chuck Barris stepped in front of the camera-- Almost Live --as the host of The Gong Show. 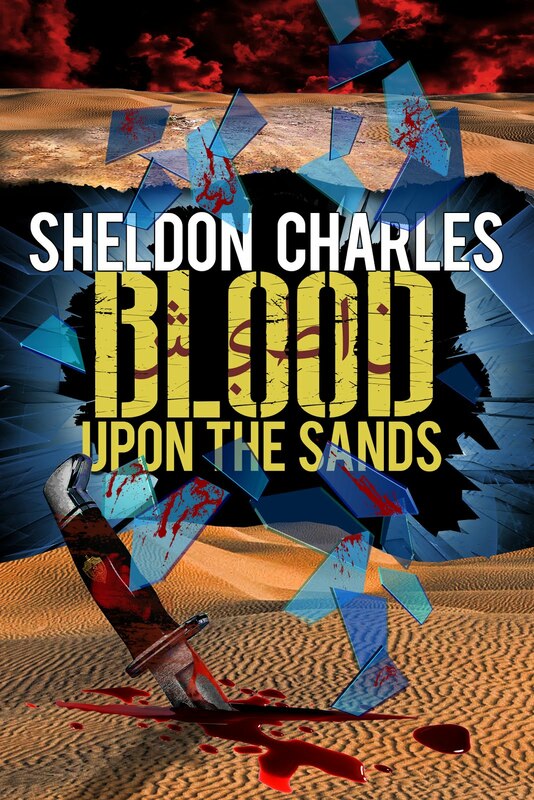 Until then he had been a behind the scenes game show creator, one hit song composer (Palisades Park) and possibly trained CIA assassin. 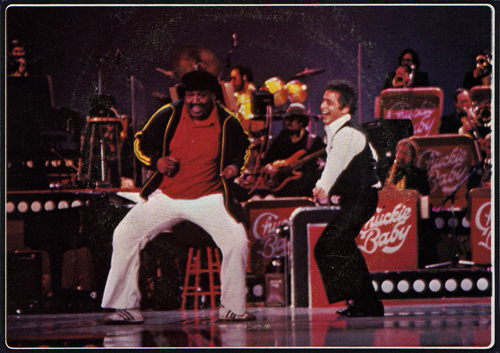 But on that day, Johnny Jacobs announced Chuck as the show’s host and he walked on stage into a role he was born for: Ringmaster of strange and unusual talent. The show was on around noonish, but kept getting moved around. Since this was before VCR/DVR time-shifting, if you did not catch it when it showed live, you did not see it. I happened into it by chance, home with strep throat and flipping the channels looking for a Gilligan’s Island rerun, or anything besides a soap opera. The show was billed as a game show, but it was indeed a throwback to a burlesque performance. In addition to Chuck as host, the show featured three celebrity judges, Milton DeLugg and his Band with the Thug, the acts - some decent, some not so decent, some just plain weird. The basic concept was, the performer had two minutes to impress the judges, and if they failed to do so, after 30 seconds any one of the three judges could bang the gong and immediately terminate the performance. If they survived the two minutes, the judges gave them a score between one and ten. Winner for the day got a check for $516.32. Righteous bucks in the 70s for a two-minute act by an unknown. Rumor had it Chuck was tremendously anxious about appearing on camera and one of the ways he would deal with it was to clap his hands at the end of every sentence. Pretty soon, the audience picked up on it and was copying his claps. He also wore a variety of hats which he pulled down in front over his eyes so he couldn’t even see what was going on. It was also rumored he was drunk or stoned, but he later denied it and said both booze and drugs or forbidden on stage. One thing was sure, he was having fun, and he was enjoying each act for all it was worth. His exuberance was contagious and fun to watch. The acts were—well as bizarre as the show. What other show featured a guy who juggled ping-pong balls by putting them in his mouth and blowing them skyward only to catch them again? Or a woman who spun plates on sticks? A girl who stuffed 30 marshmallows into her mouth? How about a trained hamster? Not to mentions more sane acts like a guy who burped songs, a contortionist and even a few folks who later made it big (Pee Wee Herman, Andrea McArdle, and Cheryl Lynn). The acts on the show were something between the Ed Sullivan Show and carnival midway, but that’s what made the show the crazed insanity it was and fun to watch. My favorite judge was Jaye P. Morgan. She was the first female comedian I ever saw to not only talk in double entendre but also make herself the subject of sleazy jokes. Until then, I had seen men do it but had never seen a woman who took the step. She did, and it was hilarious. Unlike most of the judges, who I had seen on other TV shows or on Laugh-In reruns, I had never heard of or seen Morgan before the show or after. Just like a burlesque show, there were running gags. My favorite two were Gene Gene the Dancing Machine and The Unknown Comic. Gene’s appearance would cause the entire show to stop until he finished his dance, of course, Chuck would also dance while the music was playing. Later, they started throwing balls and other items on stage while Jean was dancing. The Unknown Comic appeared wearing a grocery bag over his head and would tell jokes which were usually at Chuck’s expense. I recall a rather in-depth and spirited conversation with friends about the Unknown Comic identity. I found out it wasn’t Dan Aykroyd but a comedian named Murray Langston (sorry, Tom). There were also many memorable events which occurred on the show which are now urban legend. I was fortunate to see some of these when broadcast. One entire show featured nothing but people singing the song Feelings – – badly. Have You Got a Nickel aka The Popsicle Twins featured two girls dressed in shorts, who took a seat on stage and then suggestively ate popsicles. I missed the one where Jaye P. Morgan, in the middle of Gene Gene’s dancing, opened her shirt toward the cameras but I heard about it. Thanks to the Internet, a lot of these memorable moments are out there to still be enjoyed, even if they are a little blurry. During the show’s run, many local communities held their own version of the show. When Ft. Eustis held their version, I had to enter, I had an act sure to get Gonged. My act was to play and sing an original Eddie Cochransque song about love, loss, and undergarments -- She Stole My Underwear. 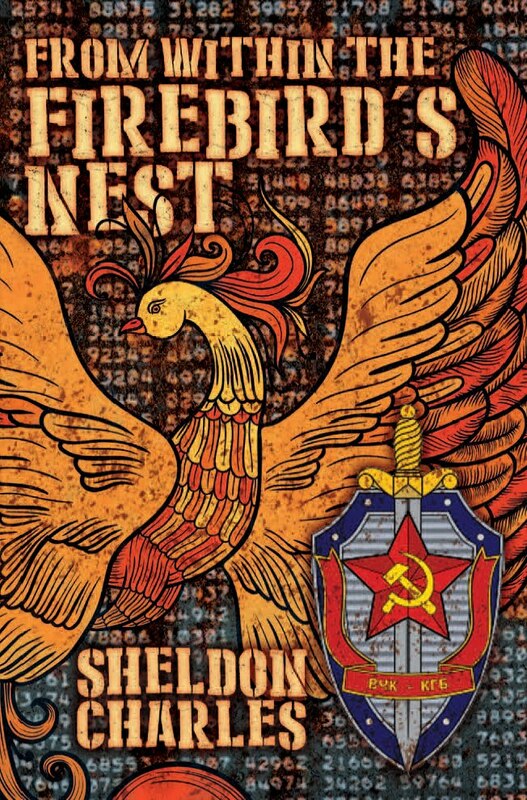 I had only written a chorus and 1.5 verses -- but it was OK because I was going to get gonged. When I walked on stage and started to perform the song, I was shocked and disappointed to not hear the Gong. So, I improvised a third verse on the fly and won 2nd place. My costume? Boxers, t-shirt, combat boots, a silver fox fur pimp hat and a pair of mirrored shades Not sure why I had all that stuff, maybe I knew the need would eventually arise. Never understood why I was not gonged – the judges must have felt empathy for a poor guy who was heartbroken over having his favorite pair of underwear stolen. I was a strange kid in High School, luckily, I never grew out of it. On July 21, 1978, the first incarnation of the show came to an end, and during the episode, Chuck Barris sang Take This Job and Shove It. The Gong Show went on for another two years in syndication before it completely vanished. As I write this, I have just viewed a few episodes of what is now being billed as The Gong Show, and it is closer to what it was than any other incarnation to have appeared between the original and now. The show is hosted by British personality Tommy Maitland (an uncredited Mike Myers). None of the acts have risen to the level of absurdity or risqué of the original, but if we give it a few months, it’ll get there. While Tommy wears many hats during his performance, he has yet to clap his hands together or use any of Chuck’s catchphrases. I think it is an even more sincere form of flattery than if Tommy had imitated Chuck. A show of respect. 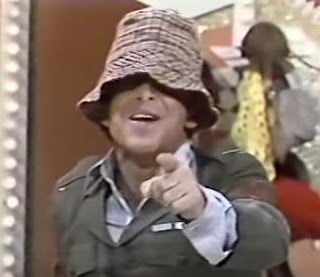 I have many good memories of watching Chuck Barris, doing his weird little dances – – clapping his hands – – and wondering what new hat he might be wearing today as he pointed into the camera and promised us he would be back with more STUFF.